Interested in using Datatrac content and technology on your website? Click for details. Save up to $396 now! Orange County's Credit Union savings deposit rates are up to 14% better than the average earning a Datatrac Great Rate Award. How can Datatrac help you find the best savings deposit? Datatrac takes the guesswork out of shopping for your next savings deposit. We are an independent, unbiased research company that has been comparing banking products for over 25 years. Our database of 1,648,658,012 deposit and loan rates is updated daily with the most current rates for nearly every bank and credit union in America, including those right in your backyard. We look at each bank's rates, fees and all the fine print to make sure we are comparing apples to apples. Then we do the math. We compute the savings to help you make the best decision. We stay with you until you find a loan that saves you money. It's free! You have access to our entire database of rates at no cost to you. If you find a loan from our services, the bank will pay us. When you see a Datatrac Great Rate Award, it means you will save money. Why? Because the rate beats the competition. Datatrac ranks deposit and loan products for financial institutions. 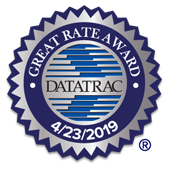 When a product outperforms the market average, it is given a Datatrac Great Rate Award® to certify its competitiveness. 1 Datatrac's comprehensive, unbiased research and analysis is updated each business day and is conducted independent of any financial institution. There is no guarantee that you will receive the rates or terms displayed herein. Actual rates and terms are in the full discretion of the financial institution and may be subject to your credit rating and other factors. Please contact the institution directly with any questions regarding their current rates and terms. The information on this website (the "Information") is being provided by Datatrac Corporation ("Datatrac") to allow consumers to compare interest rate data for different products from financial institutions in order to find a deposit or loan. The Information may not be otherwise used, quoted, downloaded, scraped, sorted, or exported without the express written consent of Datatrac. Any such unauthorized use is strictly prohibited. Oops, we did not find you automatically. Please enter your postal code. © 2019 Datatrac Corporation. All Rights Reserved.